Cyndi Wright, founder of the Bridges organization in West Plains, looks through the clothing supplies for kids in need. Listen to the audio for this report here. According to the most recent US Census data, median household income in Howell County is just under $35,000 a year. More than one in five people live below the federal poverty line, and about two thirds of kids in this district qualify for free and reduced lunches. “My last year teaching, it just was impressed upon me, through whatever reason, to start feeding high school kids. And so I started a food bank out of my classroom,” Wright said. Wright said the food was gone almost as soon as it came. “Teachers donated. Other teachers saw problems in their classrooms,” Wright said. That was five years ago. The stories of need kept coming. One kid didn’t have a bed and was coming to school exhausted. Another child’s teeth were hurting, and yet another was piecing his shoes together with duct tape. When she retired from the classroom, Wright turned this safety net into an organization called Bridges. And it just took off. 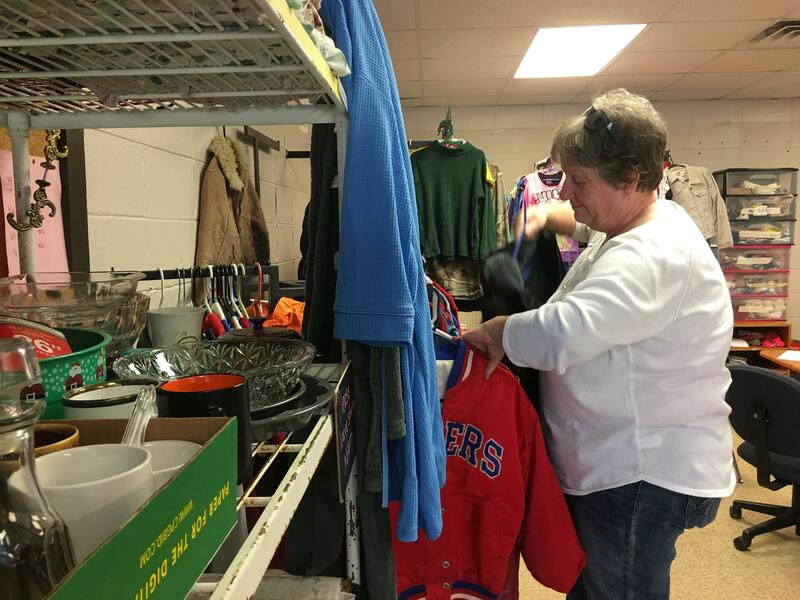 “We had a student who needed just a dresser to put his clothes in. He had nothing like that. I sent out a mass email, and within ten minutes, somebody said, ‘I’ll bring a dresser,’” Wright said. The program expanded to include doctor and dentist visits. Many low-income Missouri children are eligible for Medicaid, the government-funded health care program. But Wright and others who work in this field know that safety nets like Medicaid are far from being a catch-all solution. And often, kids slip through the cracks. “This year, we even bought a wheelchair for a young lady whose wheelchair was literally falling apart and wasn’t entitled to have one for another year,” Wright said. In Springfield and many surrounding towns, many of the hunger, health and hygiene needs that were preventing kids from learning have been met by the Springfield-based nonprofit organization, Care to Learn. Care to Learn has expanded to include local chapters in small towns like Ava, Chadwick and Clever—and we’ll look at how Care to Learn works later this week in our series. But for districts that don’t have Care to Learn, they’re either coming up with their own programs, like Bridges, or they do their best to help kids on a case-by-case basis. That can be tough for very rural areas, where resources are already slim. Cyndi Wright says the Bridges program has already developed a lot of trust. “The needs are just being met. I think I could put out a call and within 24 hours, I could have five people offering to supply that need. West Plains is a special, special community. You can’t ask for something and it not be done,” Wright said. The churches here have teamed up, she says: one church provides underwear, another sends boys’ socks, and another church provides girls’ socks. Yet another church provides a back-to-school fair with school supplies. Wright works closely with Dr. Amy Ross, director of special services at West Plains schools. Ross says there are 107 kids in grades K-12 who meet the definition of homeless right now. That includes everything from sleeping in a cemetery or their car to “doubling up” with another family. It also includes several families living out a motel here in town. “They only had four or five rooms that they would offer to homeless families and they would pay by the month. They have now opened that up to where three sides of the hotel are now families who are living there month-to-month,” Ross said. Ross is also the chair of the board for the homeless shelter in West Plains. She says a deposit on an apartment is too much for most of these families—so they use their disability checks to pay by the month at the motel. Some have food stamps, but Ross says, those almost always run out. So Bridges is supplying slow-cookers and microwaves and beans and ingredients for stew to these kids. “You know, we’ve tried to teach them how to use the Crock-Pots and microwaves. Anything that we can give the kids to be able to take care of themselves, even in the evenings as parents are working a second job,” Ross said. And there’s the issue of transportation in rural areas. “We had a student one time who was riding his little sister’s pink bike with the tassles on the handlebars. And it was, you know, a 17-year-old boy.But he didn’t want to tell anyone,” Ross said. Bridges exists almost solely on community donations. And West Plains is unique in that it has one set of schools for kids living inside the city limits—and five, satellite rural, K-8 schools that operate with independent school boards, with all of them feeding into the same high school. Bridges provides supplies to those children, too. This approach to schools taking such an organized, proactive role in serving emergent needs is relatively new and still evolving in our area. Ten or 20 years ago, a teacher or principal may have gotten involved on a case-by-case basis—that is, if the school ever learned about the problem in the first place. The idea is simple: remove the barriers from a child’s ability to learn. Traditionally, this was seen as a family’s responsibility. But schools have realized that a kid’s success may rest on the wide-ranging force of generational poverty being met with an equal or greater force: community love and support. Our Sense of Community series on the impact of poverty on education continues all this week at 7:45 AM and 4:45 PM on KSMU.